Friday night, I realized that it was the yahrzeit (anniversary) of my father’s death three years ago (he died on April 8th, but Jewish observances run on the lunar calendar, so things can catch you off guard). So the weekend started on a somber note, which may have been why the weekend also brought the realization that CatofSize (aka ‘the old man’) now only has a few really alert hours in the day (mostly before 6am). 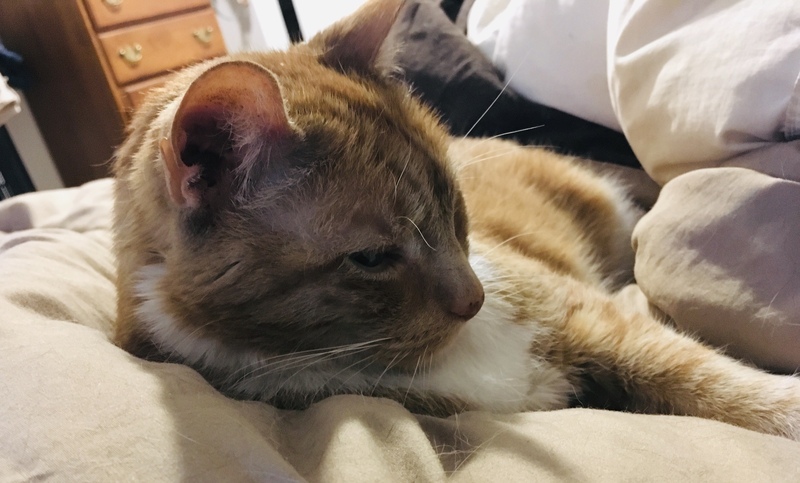 It’s not surprising – this month marks his 16th birthday (observed) and he may actually be a little older. But that, combined with the appearance of joint stiffness in his hips and legs, and a decreased appetite, was a reminder that we’re not given unlimited time with our animal companions. He’s still content and comfortable, but there will come a morning when he doesn’t come in to cuddle up on me before I’m ready to be awake, or an afternoon he doesn’t make like a furry shark asking for a snack when I come home. This is inevitable; there’s no snooze button on this clock. So I’m making an extra effort to give him time in the morning, just the two of us. And I’m also making an extra effort to give the Kitten of Thursday more time in the evening. Because CatofSize has been a constant in his life for 6 years, and he’s aware that Something’s Wrong. And when the time comes, he and I will have to comfort each other. Anyway, I don’t really have a Lesson to Impart here, except that I’m looking out my window and seeing the trees blooming, looking at my desk and seeing tulips and daffodils in the vase, and being reminded that everything has its cycle. There’s nothing we can do to change that, and I’m not sure we should even if we can. Love is delicate. Life is finite. Make good decisions. Cherish the purrs, and then let them go. Want to help support a writer and her cats? There’s a tip jar for that! Previous Post: My Norwescon 2019 Schedule! Next Post: The Write Stuff 2019 is Live!